Busy Week, Summer Fishing Still Swinging…. Sat. Aug 30, 2014….A rare Aug Saturday off, at the home office today playing catching still from being out West, and a busy week of trips. 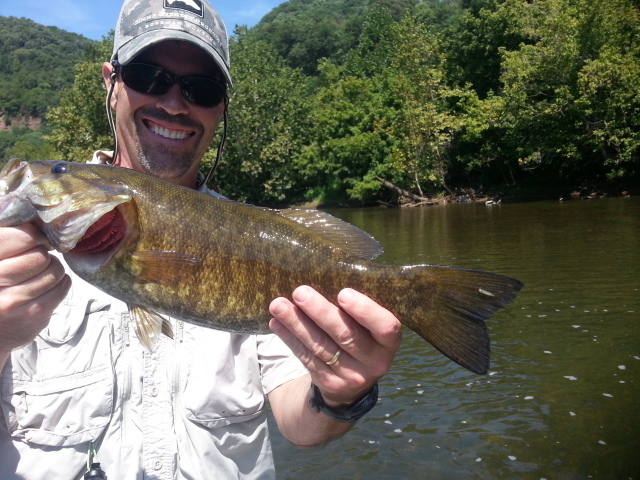 Several floats this week, got into some good fishing for smallmouth. Also did a beginning of the week presentation for the Trout Unlimited group in Raleigh, NC, the Triangle Fly Fishers, and had a blast there. Did a program on Entomology. In fact, if you ‘d like to check the program out you can do so and view the Powerpoint presentation I gave by clicking here . Did a float trip with Dr. Jeff Hutchison, Columbus, OH, we had a blast and Jeff was great to spend a day with. I meet and get to fish with some truly wonderful folks……the fly fishing lot is quite a great bunch of people. For our day on the New it felt like summer still has its grip on us, it was nice early today bit quickly got hot. 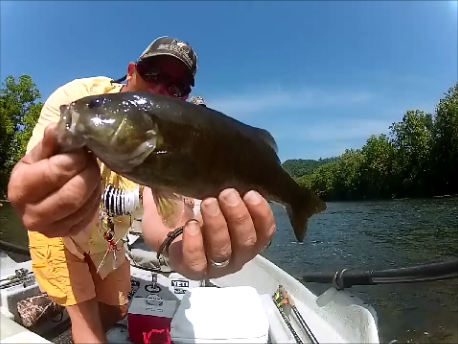 I guided Jeff on a New River float trip below Pearisburg, VA. We landed about 30 or so smallmouth on poppers and streamers. Jeff worked hard for every fish, we pretty much had the river all to ourselves…..the entire 6.5 mile float……It was great and sure glad we had plenty of cold water and gatorade. The fishing was okay, not on fire, we caught plenty of fish but I would have suspected a bit more of a topwater bite….with as much grass as there is in the river, the damsels and dragonflies flying, epic topwater bite in this part of the river is coming….Lots of fish doing Air Jordans from the river….jumping for the tons of flying blue damsels in the air. Jeff was great to fish with, a pleasure to spend a day with…both the fishing and the company in that respect were stellar. 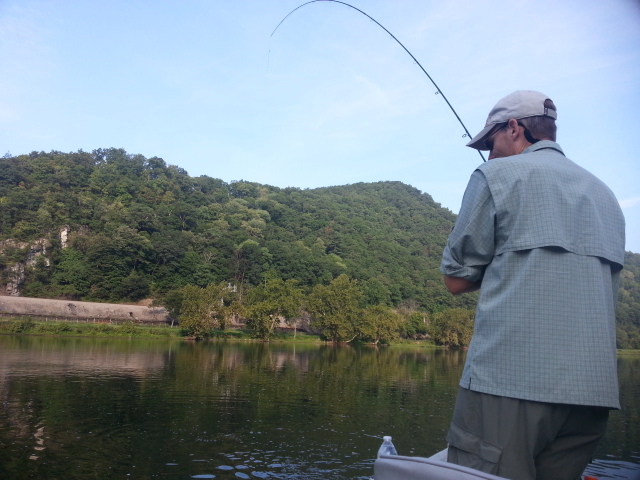 Look forward to fishing with him again…We fished late , got him back to his vehicle in Galax, VA well after dark. Long day….but enjoyable. Yesterday’s float was below others earlier in the week, I guided Bob Stanford, Greensboro, NC, on a New River VA smallmouth float trip, another early start, we did a long day…til dark in fact, pulling up to the take out and it was dark….Got an early start and we were in the water by 830am, things were very windy to start as a dry front pushed through, we were going to fish a long stretch of flats and I was greatly looking forward to a good popper bite but it was very windy….How windy? try 30-35 mph sustained with gusts to 45mph. The long open stretch we start on was whitecapping with 1 to 1 1/2 foot waves on it…..like being at the coast in a small craft advisory. We floated through to the first string of islands where we could get away from the gusty winds. Fortunately the fishing picked up and the wind turned down to almost zero finally. It was slow going til about 11am until we started to bang fish pretty good. From then/there on, it was epic. Bob fished light tackle and flies, we boated fish both ways, a lot of fish both ways, and ended the day on an epic topwater popper bite, smashing several nice fish the last 2 hrs of daylight on top. We caught some hogs, broke off a couple on poppers and 2X, so guessing they were beasts as it takes a good fish to snap off on those. 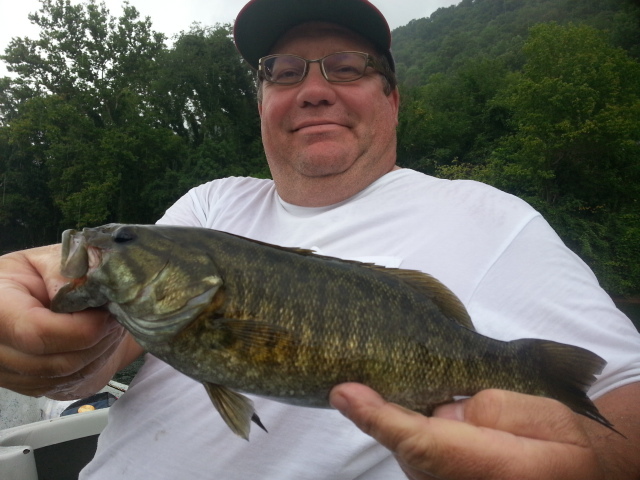 I estimated Bob put close to 75 smallmouth in the boat. We had a little bit of everything, catching them deep, slow water, pockets, mid river bars (this part of the river is loaded with them), catching them in boiling whitewater pockets, and even got to sight fish to fish ….a lot. Sight fishing to smallmouth with topwater bugs is right up there with any surface fishing you would ever do…..amazing how those big fish sip a bug like an old brown trout. The grass is really flourishing in the river and the bass are eating…..I look for September to be epic if we don’t have any of those blow out rains like we can get. Also, some big fish will be on the move as well. Will be a good time to get on some smallies if you still want to do a trip before the weather turns cold. Put the cameras through a real workout yesterday, my ‘G’ brothers……the GoPro and the Galaxy …..were exercised hard yesterday. Got a ton of neat clips, just a few here (below) from this week. Got some neat underwater shots, some I have yet to download and work on, that I will put in upcoming videos. 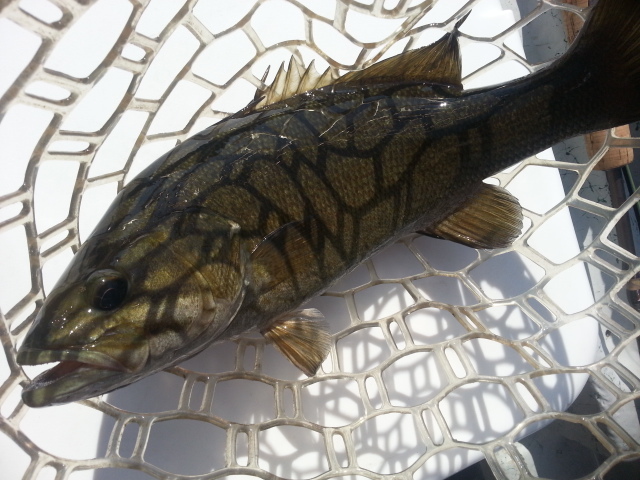 One was at a place I call the sink hole rapid….its a fast swirling hole mid river that is surrounded by bars and shelves and is loaded with smallies. There was one spot where there was a wall of baitfish underwater 20 yds long, six feet thick top to bottom, and about 20 feet wide. Enough minnows to feed the several thousand smallies in this pool. 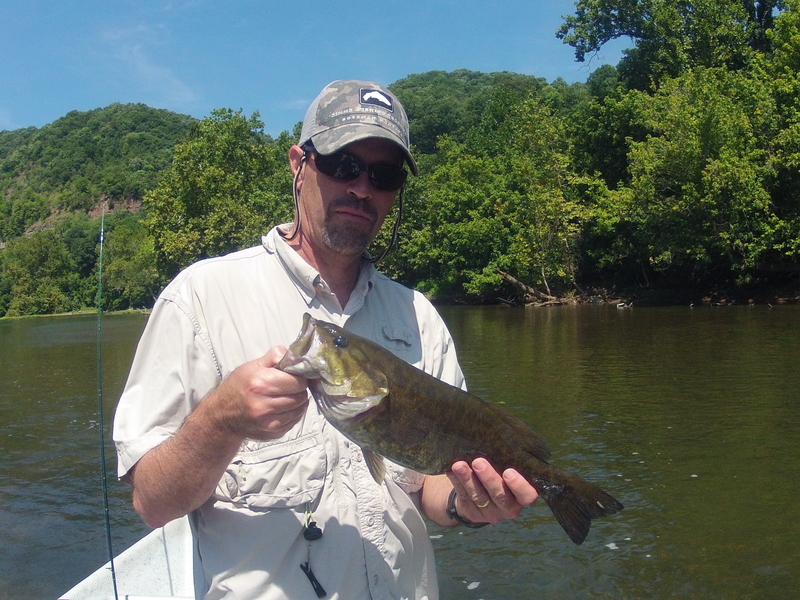 Have another busy week coming up, will be doing more smallmouth fishing plus several South Holston floats. The sulphurs have been spotty at best but the bobber fishing has been great…should be some great days. Looks like we have decent weather coming up. A little rain in the forecast, but no tropical events and no blow outs it appears. My fingers are crossed. 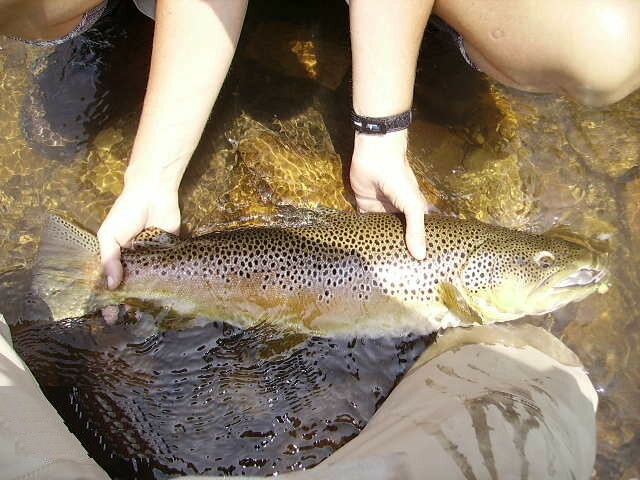 Our local NC fishing will be wide open soon on a number of our mountain trout waters. Fishing has been good on most waters, as we have had better than average water levels. October through December are one of the busiest times on my calendar and right now trip bookings are way up over last year. Should be a great fall season, and I can’t wait. If you want to fish, time to make plans to do so, my calendar has been steadily filling……and we don’t want to be nailing some nice fish and not get you in on it. 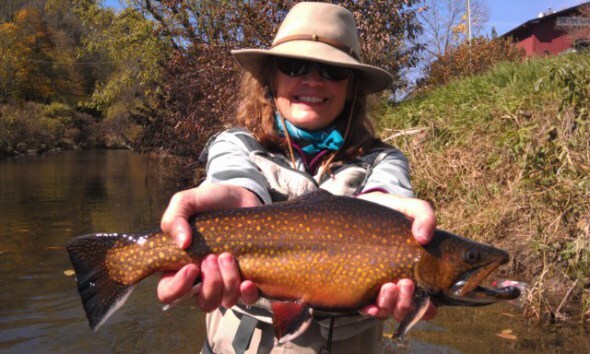 Fall is prime time to nail some large browns and brookies, and as most of you know some of the fall brookies are epic. Many thanks to GoPro , Simms , Sage, Redington, Rio , and Yeti who provide me with the best gear in the business…..makes what I do a lot more enjoyable and fun…. Summer Still Has It’s Grip…. Thurs. Aug 28, 2014…..Busy week just got back from our Wyoming trips this weekend as well as a Monday night presentation at the Triangle TU chapter meeting. Today felt like summer still has its grip on us, it was nice early today bit quickly got hot. 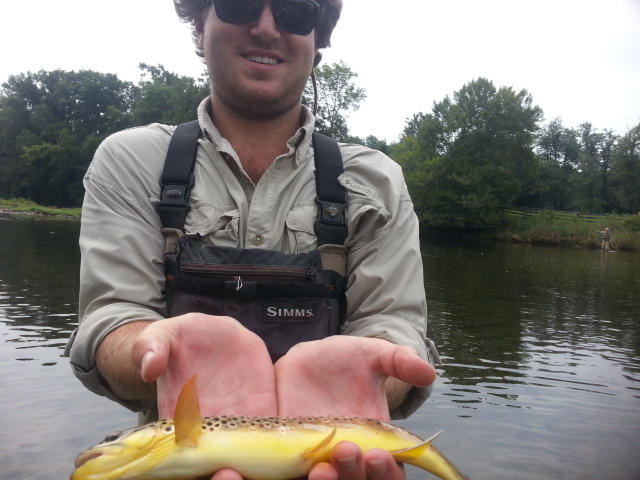 I guided Jeff Hutchison on a New River float trip. 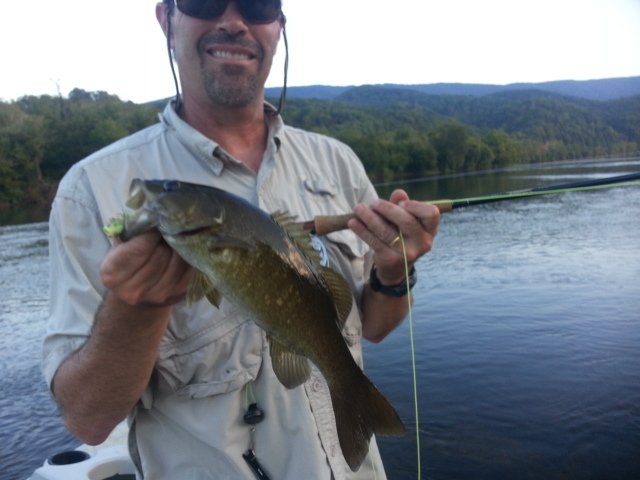 We landed about 30 or so smallmouth on poppers and streamers. Jeff worked hard for every fish, we pretty much had the river all to ourselves…..the entire 6.5 mile float….it was great sure glad we had plenty of cold water and gatorade. It was hot….. Doing another New R trip tomorrow guiding Bob Stanford, another early start to beat the warm temps. Fri. Aug 22, 2014…Doing this report from the breakfast front room at the Black Powder Ranch in Wyoming, first real chance to do any posting of any size on the site, up bright and early this morning as myself and one of the guys on the trip are having coffee and making preps for our final day of fishing. We have some rain this morning…….wet morning in WY. Rare. But the fish will rise like mad today! Here’s the first report I did from my tent in the High Country, with some added in after that. Read on! Our trip has been a good one so far, we have been off the grid as we horsepacked 17 miles to our camp on the remote South Fork Buffalo, which is the headwaters of the Snake River. Two pack trains, 21 horses total, 12 pack horses loaded to the max with all our gear, all our guys (6) and Max, Josh Roth, Rod Piper our horsepack and trail team. We packed in the entire distance Saturday had dinner by the fire, and got up early and headed early after breakfast and spent the entire day fishing remote Lick Creek and the upper South Fork of the Buffalo. We fished a total of 25 miles in from the trailhead. Off the grid, fishing to fish that have rarely or ever seen a fly. Ever fished that far into a Wilderness area where the land and water are virtually untouched? We did, and you can next year……so join me! The first day , Sunday, we smoked em on dries and the guys each landed 20 to 25 or more and we probably tallied around 150 fish, mostly wild brook trout and a few cutthroats fishing from Pendergrass meadow just East of camp . All fish on dry flies. On Monday we had breakfast and then rode horses to two remote lakes, Angle Lake and Golden Lake where we caught some monster cutthroats up to 23.5 inches. Many of them we caught sight fishing with dry flies. Later, as the weather warmed the fish moved deeper where we had some success catching them on wooly buggers stripped deep. On Tuesday we made the ride to another remote lake called Mackinaw Lake where we caught more Cutts, some on dry flies and some fishing deep with buggers. 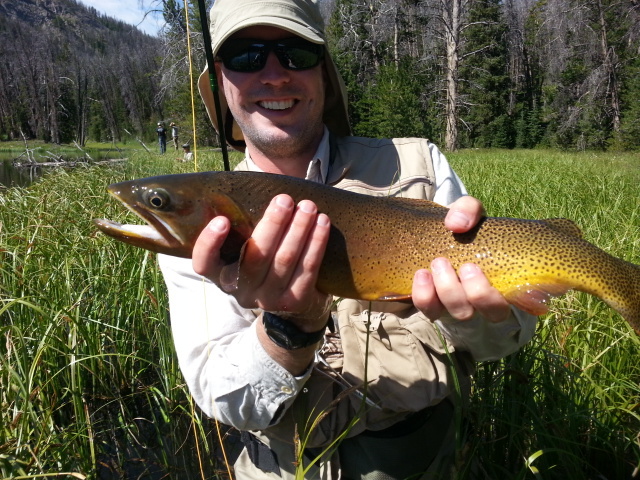 Not as many as we caught on Golden Lake, but some nice fish, and a couple of cutthroats as large as I have ever seen. 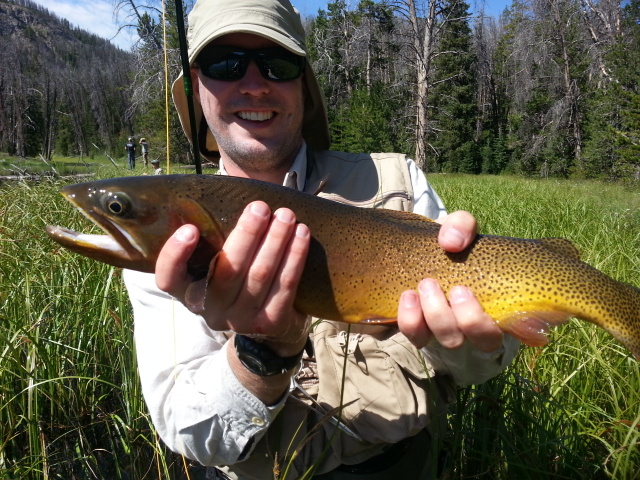 One really enjoyable catch was watching Ken Karb nail a monster cruising cutthroat on a black ant. We fished there a half day and then rode back to camp where we finished up with about 75 to 80 brookies on dry flies. 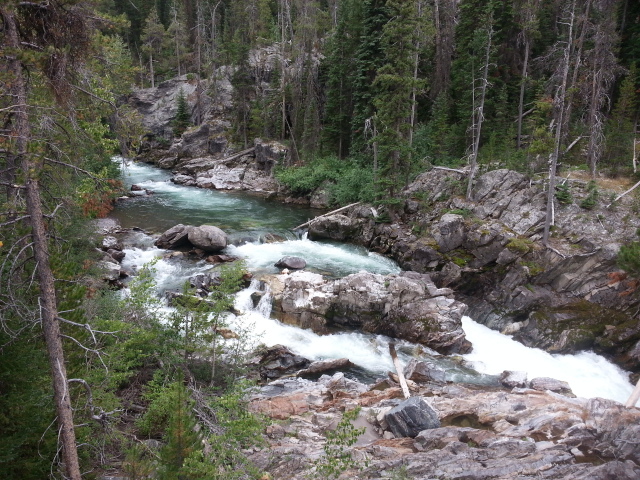 It’s Wednesday morning, and I am doing this report from my tent at about 8100 ft…..on the South Fork of the Buffalo. A 17 mile ride back to the trailhead then off to Jackson we will be and down to Bondurant, WY where we will be spending the rest of the week fishing the Hoback, Jack Creek, Cliff Creek, and the Green River. We got back to the trailhead and our vehicle late afternoon and we loaded up everything and were back in Jackson, WY by 5pm. We made a couple stops, gassed up the vehicle, and headed to the Black Powder Ranch in Bondurant. We had a nice steak dinner (unbelievable) at the ranch main bunkhouse and then we were to our cabins for the night. We got up early on Thursday and after a fantastic breakfast we did our lunches and then we were off. We had some rain early in the day, the forest service roads were quite muddy, and the Hoback River, Granite Creek, and a couple of other waters were muddy or off color, so we then were off to Jack Creek that is adjacent to a large tract of land a friend of mine Scott Leeper owns and a large piece of property and house he has for sale. 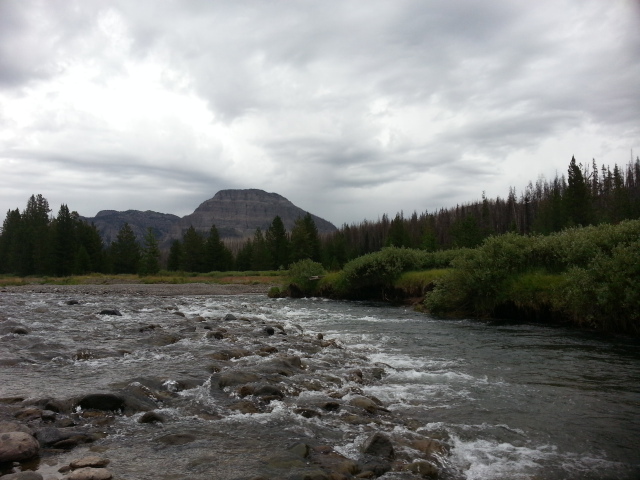 We hiked into the meadow and caught some nice cutts and brookies up to 15″ ….beautiful water….what a meadow stream. We fished til about 5pm and headed back to the ranch and to our cabins to get cleaned up for dinner. We had dinner at a local place, a fave with the locals, called ‘The Bird’. Had an awesome dinner, and then back to our cabins. I am up early this morning, Friday, doing this report and we are just getting ready to have breakfast. After breakfast, we are off to Jack Creek and will be hiking up to a remote meadow that never gets fished as a lot of folks don’t know its there. 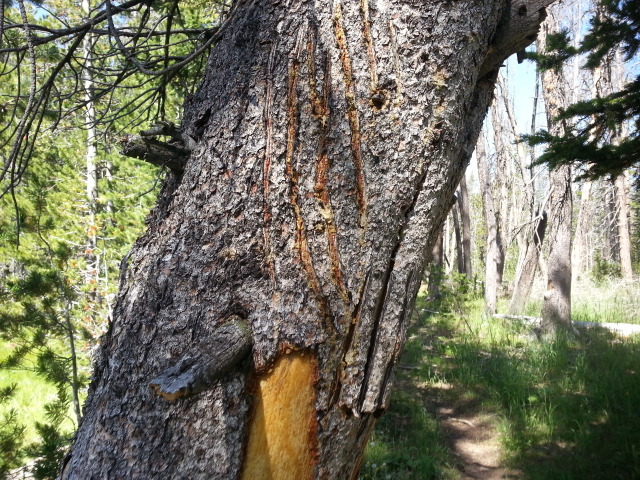 We will be parking at trailhead and hiking a high sagebrush ridge to get to the creek. Should be a good day, we have rain again, looks like it could be all day. 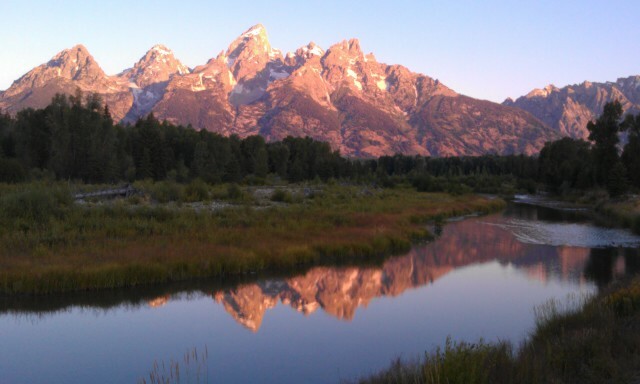 We fish today, up early at 4am to get the the Jackson Hole Airport for our early morning flights home. Might be a good thing, as snow is in the forecast for Saturday…..? Yes indeed. Headed out to guide the group today and we’ll be looking forward to a great day. Will post another report today. Have a great day, and a super weekend……best wishes from high in the Hoback Canyon, WY…. 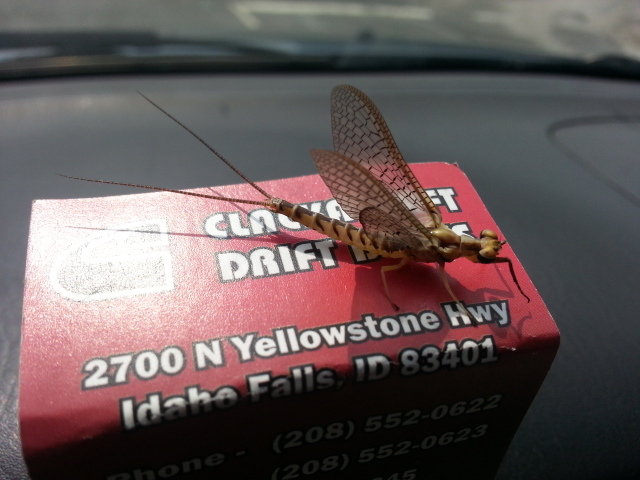 Wed. Aug 20, 2014…Our trip has been a good one so far, we have been off the grid as we horsepacked 17 miles to our camp on the remote South Fork Buffalo, which is the headwaters of the Snake River. We packed in the entire directory Saturday had dinner by the fire, and got up early and headed early after breakfast and spent the entire day fishing Lick Creek and the upper South Fork. The first day , Sunday, we smoked em on dries and the guys each landed 20 to 25 or more and we probably tallied around 150 fish, mostly wild brook trout and a few cutthroats fishing from Pendergrass meadow just East of camp . All fish on dry flies. On Monday we had breakfast and then rode horses to two remote lakes, Angle Lake and Golden Lake where we caught some monster cutthroats up to 23.5 inches. Many of them we caught sight fishing with dry flies. Later, as the weather warmed the fish moved deeper where we had some success catching them on wooly buggers stripped deep. Fri. Aug. 15, 2014…..Got in late yesterday here in Jackson Hole, Wyoming had easy travel and a nice dinner in town. Out early this morning, it was still dark and temp 41F and you can see your breath. Some showers yesterday made for some incredible photo ops this morning. 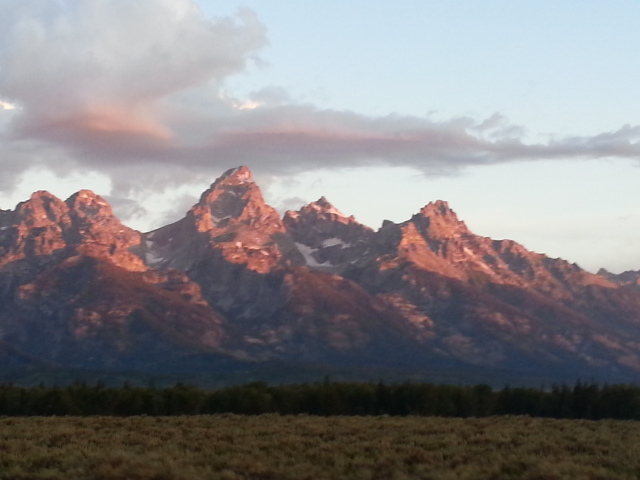 Spent an hour getting some spectacular shots in Grand Teton National Park. Some were absolutely stunning, and got some great video with the GoPro as well. Having breakfast then heading out to Bondurant to meet with and spend some time looking at a property that is for sale owned by a guide friend Scott Leeper . Will then bend the rod on a few cutthroats before coming back to town this evening and picking up my group from the airport. Have some great pics to share…..stay tuned and check out our site too…. Fly Tyer’s Weekend Event Returns…. Sat. Aug. 8, 2014 ….A great event coming up this fall, great if you tie flies, great if you want to be inspired to learn….even great if you don’t. I promised an update when more details became available, so here goes….I will be one of the tyers at the event, so come see me! Bring a rod, all your fly fishing gear, make a weekend of it! Come to the Great Smoky Mountains National Park in Townsend, Tennessee in early November. The crowds of leaf lookers are almost gone. The streams are cool. The trout are active. Fishing can be awesome. Tremont Lodge and Resort has partnered with Little River Outfitters to bring you the East Tennessee event of the year. Forty or more fly tyers, guides and excellent fly fishermen will be on hand to tie flies and tell you how, where and when to fish with them. You will gain fly fishing knowledge, meet new friends, hang out with old friends in one of the most beautiful places on earth, Townsend, Tennessee. 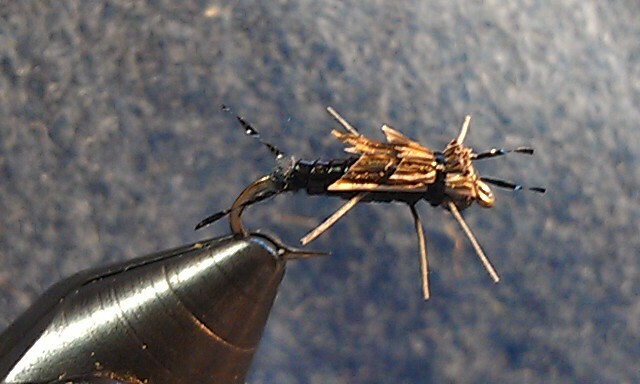 Fly Tyer’s Weekend is free. There is no admission charge. It will be held indoors at the Tremont Event Center. You don’t have to stay at the lodge. You may stay at home. Or, you may stay somewhere else. We just want you to be here and enjoy our event. Of course we would like for you to stay at the lodge and support one of the partners. Hopefully you will also shop at Little River Outfitters while you are in town. Mike Adams, Walter Babb, Jeff Barrett, Mike Bone, Bill Boyd Jr., Bill Boyd Sr., Phil Brandt, Mike Bryant, Buzz Buffington, Dean Campbell, Dave Carson, Rocky Cox, Jack Cummings, Rob Fightmaster, Clayton Gist, Jack Gregory, Anthony Hipps, Kevin Howell, Tim Ivey, Gary Jones, David Knapp, Tyler Legg, Tradd Little, Roger Lowe, Shawn Madison, Stack Scoville, Josh Pfeiffer, Larry Rogers, Scott Sanchez, Jeffrey Wilkins, Rex Wilson. Tremont Lodge and Resort, is a beautiful and totally remodeled property in Townsend. 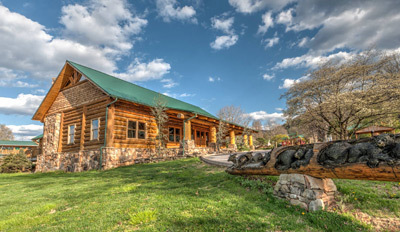 The lodge is perched on 16 acres, right in the middle of town. It consists of 140 rooms and suites. Waterfalls, an indoor swimming pool, and beautiful conference facilities are on the property where Fly Tyer’s Weekend will be held. Walk or ride your bicycle to restaurants. The paved bike trail runs through the resort. Tremont is the ideal place to visit the Great Smoky Mountains during the fall. 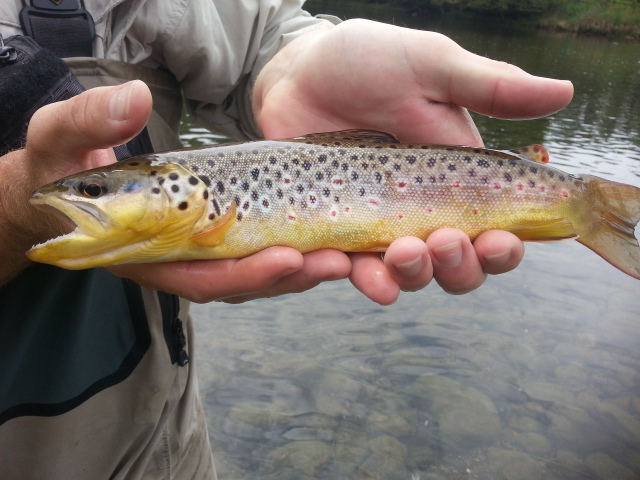 Fly fishing is usually excellent in early November. Read Full Details about this fantastic event……click here . Make plans to be there……you will be glad you did! Busy Week ……And Some Much Needed Rain for NC….. Sat. August 9, 2014….. August has been busy so far, quite so, we’ve been busy with trips, flies, and getting ready for upcoming time in Wyoming and Idaho. Had some good days the past week or so, the mantra lately has been ‘sorry for the late post’ ….and ‘just catching up on posting…’….so in that vein, let me say that again. Its been a busy time, and I am thankful, but this report is tardy as it has been a lot lately. Here’s what’s been going on…. 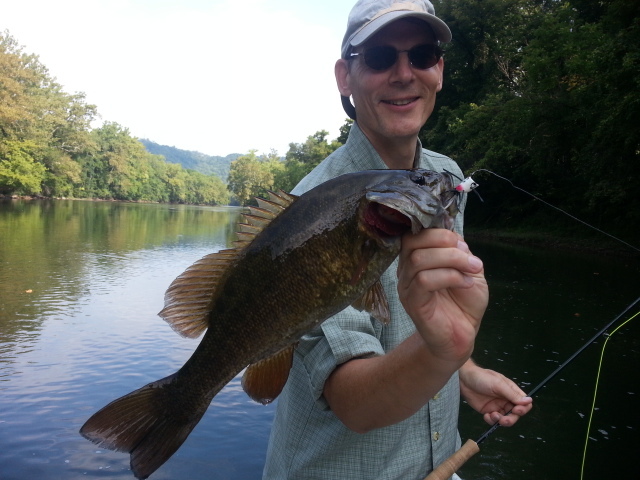 Have been on the South Holston a fair bit this summer, and had some really good days lately. 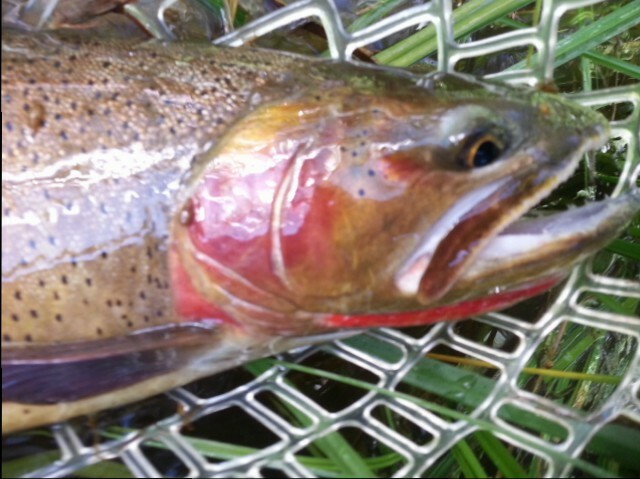 Our latest post went like this….Out early guiding Kelly and Joseph Harrill, Jack Harrington, Greensboro, NC, TN South Holston, early start and another cool morning in the hills……49F in Boone this morning… We had a great day on the SoHo, netting around 50 fish, a mix of browns and rainbows but mostly browns…..to 16″. 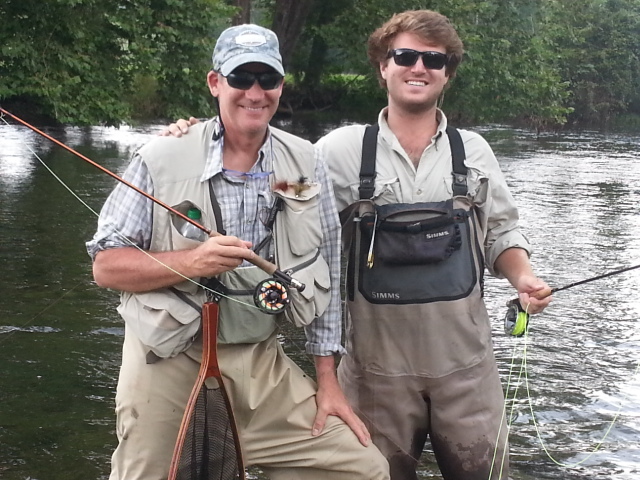 It was Joseph’s first day fly fishing, I showed him a few casts, some line management techniques, and within 10 minutes he’d caught 4 fish. So, we moved on to one of my favorite spots…..
Folks say “you don’t take a beginner to the SoHo…”….nonsense. We did what I have been doing for almost 27yrs now on that river, that is short but accurate and careful casts, sight fishing to fish only that we could see. Bag the nonsense of just scatter casting the water. That type of hotspotting works when the fish are real active and a hatch is coming off…but is the main reason folks don’t catch a lot of fish when its not like that. A sulphur hatch and rising fish , they catch fish. No sulphur hatch, they are having a tough time and barely eek out a fish or two. The answer? 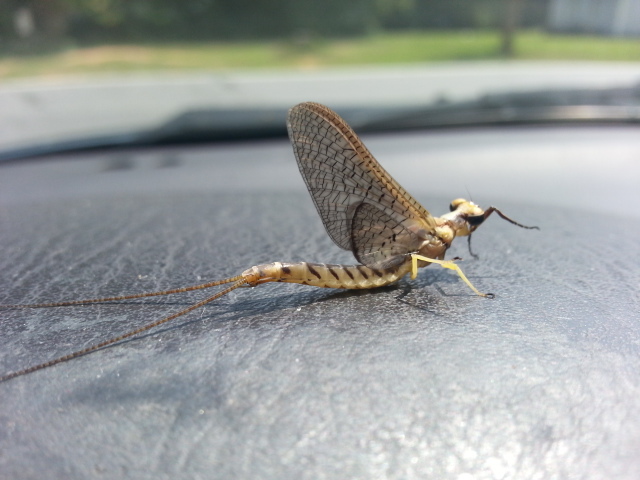 Quit spraying the water with a million casts…..find a fish, or group of fish. Watch them, study them….notice I haven’t said a word yet about making a cast. That’s the secret. 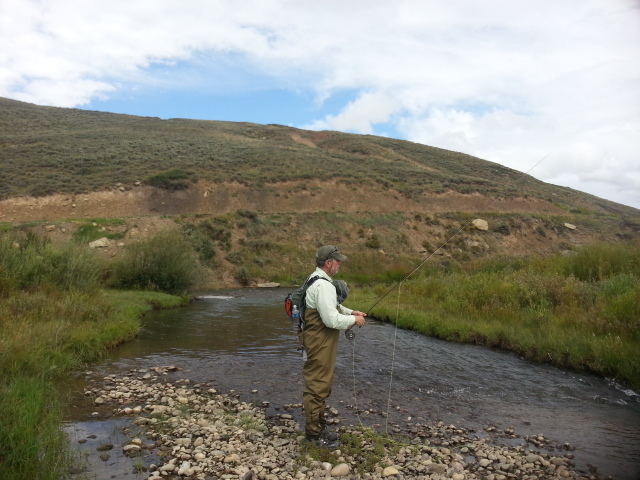 Don’t flail the water with casts everywhere …..that’s the main reason the fishing is tough. Within a few throws most fish within the length of the cast are gone. Then measure out a length of line, make a presentation…not a cast, a presentation. A cast can go anywhere, a presentation is put right where the fish are, goes only over the fish, and ends the moment it drifts over and by them. STOP. Now, evaluate what just happened. Did they look at the presentation? Did they ignore it? Those are the questions that need be asked. And that is the difference a guide can make. When its tough, challenging, those are the little details that make all the difference. Actually, they make THE difference. So, how did the above shake out when we did what I am talking about? Joseph landed one short of 25 fish, and had one on that was a beast……a 20 in plus wild South Holston brown trout….the kind of fish that is streamwise and you don’t ever catch by accident. And he was a total beginner, never been fly fishing, but when he intentionally applied , carefully applied what we went over, magic. He landed half of the fish the party of 3 anglers caught today. We fished the first area and did quite well, no sulphur hatch, but as usual you could find the occasional riser here and there and about one out of 4 of those would eat a sulphur. We smoked them on midge patterns using my summer stalk and sight fish approach. 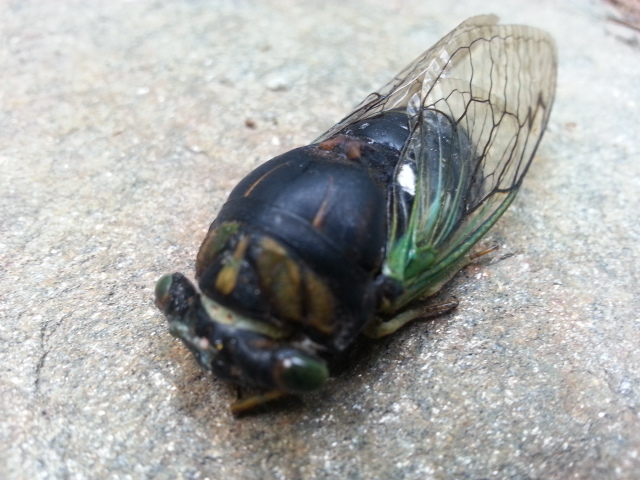 Jack did well on terrestrials, he and I covered several places and shall we say, “enjoyed a rather pleasant terrestrial bite…”…..and no, not on beetles. 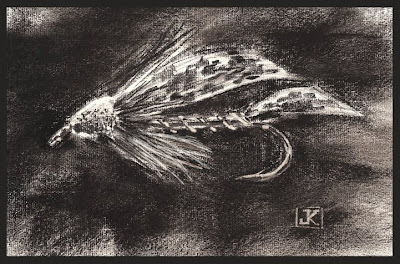 When the midday pulse came through, I put Kelly in a spot and he nymphed a small run/channel and quickly nailed about a dozen fish, mostly browns from it, on a variety of nymphs, including one of my summer favorites called a ‘Turd’…..(local name). It was then time for lunch but when I asked the guys they said, “no, we’re good” we can just keep fishing. I noticed a dark cloud building up, strange since the weather folks said 10 percent rain chance and the radar was clear. Well, don’t always trust your weather app. Kelly’s phone and my phone both indicated nothing significant on radar. Then the bottom fell out…..the storm basically developed right on top of us, we got close to 2.5 inches of rain in 30 minutes. All drenched. First time ever I have been knee deep in water INSIDE my waders. And one of the only times I haven’t had the rain jacket on me. You never stop learning lessons…….We went back up to the car and had lunch and then went downstream to another spot, and Jack caught the last 3 fish on terrestrials before we called it a day. Good day, I was so proud of Joseph and how he did. Needless to say, he’s a convert…..
Over last weekend was supposed to do a float with Bernd and Nicole Druebbisch, Greensboro, NC, VA smallmouth float trip, but we had all day rains, some of them heavy bumped up flows where we were going to float and things are high and muddy, we did a lake /boat trip instead…..It was a chilly, windy, drizzly morning and the temp was 59F….this is August right? I met Bernd and Nicole here and we put the boat in and were on our way. Fortunately we did not have heavy rains, or steady rain, that would have been miserable. It was tough fishing, to be quite honest, we worked for our fish and put maybe 15 or so in the boat, had several others on that came off. 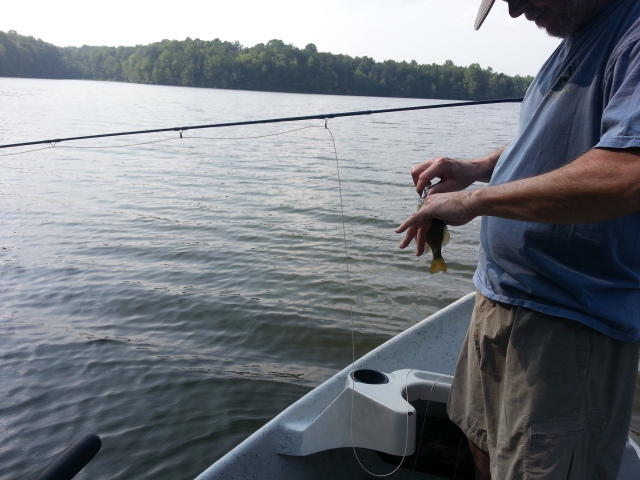 Mostly bluegills, and we were fishing deep. The rains of the past day and a half raised the lake level 3 inches or so, which takes a lot of water to do that, and the water was quite dingy, much different than the conditions I have enjoyed all summer long where many times sight fishing were possible. We fished deep, very deep, 12 to 14 feet, which is tough to do on flies, but we did it. Bernd used the fly rod, Nicole used both fly and spinning stuff……Caught some nice gills, had one huge shellcracker on that came off, and finished the day with one very nice fish. Nicole and Bernd were troopers, we still had a great time….. 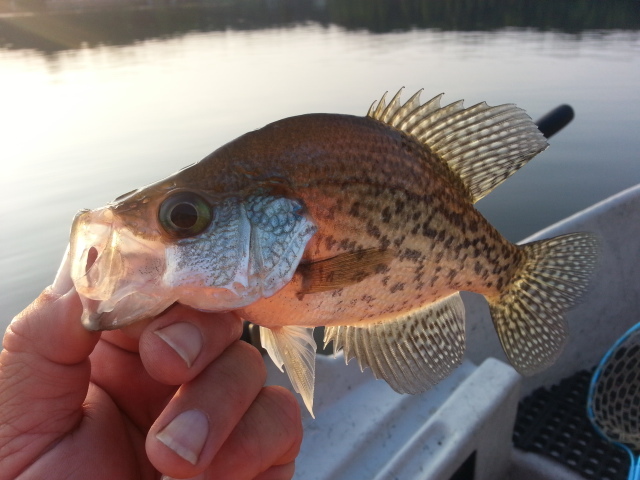 Early in the week I did a Bass/panfish Trip with Adam Harman, met Adam mid afternoon and we were off….we fished some main lake points and deep flats, and caught some huge bluegills, shellcrackers, and finished up with a nice crappie. Lake Levels have come down since the rain, and the water is clearing again. Fishing was good, was testing out some custom sink tip lines I have created, and they worked well, catching fish consistently beyond the 10 to 12 ft range. 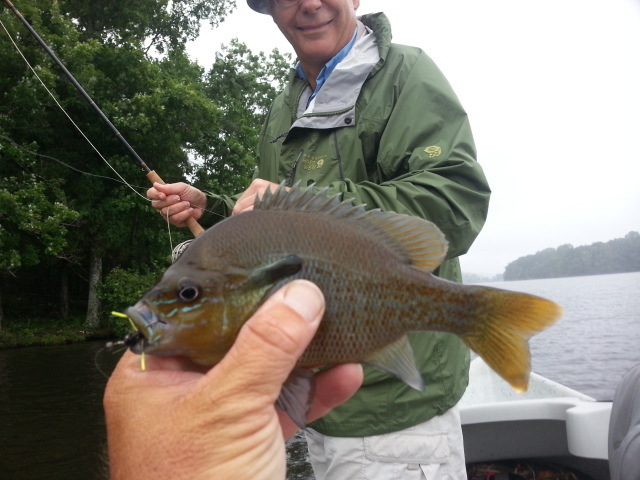 The RLD flies worked great as usual, its the best panfish fly there is……it was fun, and proved yet again you can fish large panfish all summer long if you are willing to fish deep with a sinking line. 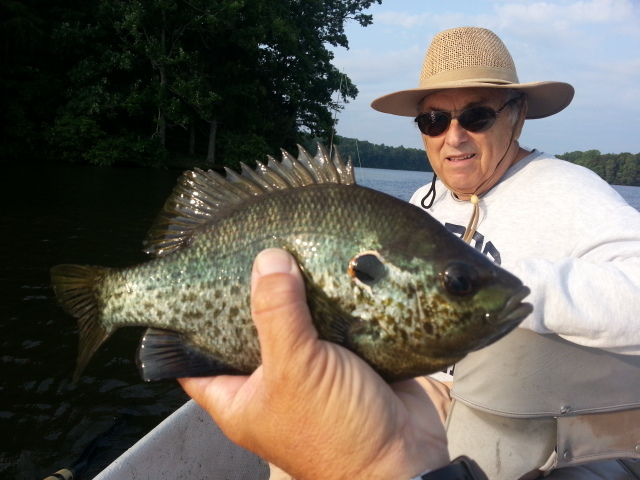 Did another Local lakes trip mid week with David Carter, Greensboro, NC, we landed about a dozen to 15 shellcrackers, longear sunfish, and bluegills…….wind shifted to the North and with a front is on the way in it really shut down the fishing. Had been really catching a lot of fish but not this afternoon…..David worked for them. Some significant wet weather moving in for the weekend, we could be in for another round of heavy rains. 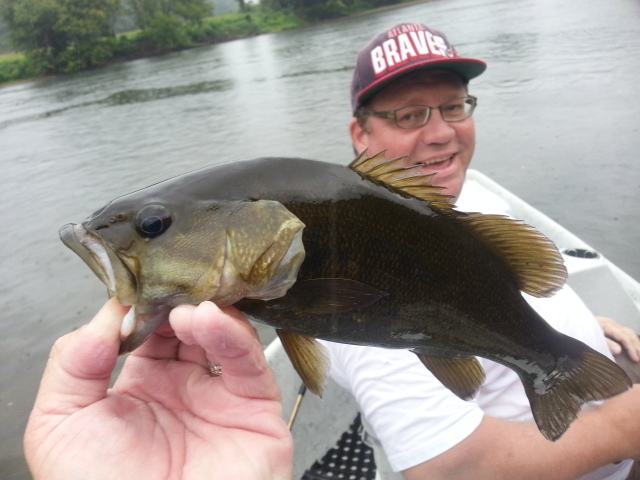 Ended this week with guiding a Va float, Greg & Alexander Adzima, High Point, NC, Boone, NC, VA and we did a smallmouth float trip, the rains will held off…for about two hours in the morning, looks like we are in for a mighty wet weekend…..Out early 430am, trying to beat the weather moving in. Picked up Greg and then we met Greg’s son Alexander in Lambsburg, VA and headed up toward Pearisburg, Va. We dropped the boat in and were on our way. 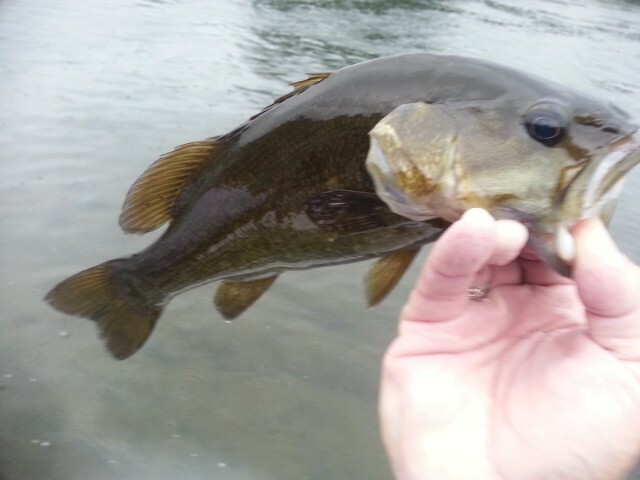 We knew bad weather was on the way but were ready for it…..and I looked forward to a strong smallie bite as the weather change occurred which will often happen when a front moves in. That is exactly what happened, it didn’t take long to get into a few fish, we caught a few right off, then floated through some water to get to one of my favorite stretches. We did pretty well, and as the rains came on, the fishing was steady. We didn’t get heavy rain til 11am or so, but when it came, it came. Steady the rest of the day. We stopped at a mid river ledge /foam hole and had lunch, and caught some nice fish there. We floated past one of my favorite strings of islands, and floated through one of my favorite musky spots. Spotted one large fish, over 40 inches, cruising through some deepwater slackwater weed beds, he saw us, never fleeted, but slowly cruised away. Shortly thereafter saw him again, and another fish, I had Alexander make several throws to the fish, he made some good throws but we could not get him to eat. I suspect we were minutes away from getting one of them to eat…dark day, low sky, rain….perfect conditions for a big predator to eat something. We fished to them for about an hour, then decided to float on through as there was still a lot of great water to fish. We did well, and caught some really good fish too…….we spent about an hour in the treacherous “Ledges” rapid upstream from the boat ramp/takeout pick pocketing the holes and caught several really good fish, probably the best two or three fish of the day. This spot doesn’t get a lot of pressure because it is tough to get to and get through. After picking some fish from the rapid, we floated on to the takeout. It was a good day, no one else on the river….not surprised, low 60s and heavy rain keeps a lot of folks home. We boated 45 t0 50 smallies….Good fishing will cease here for a few days, as runoff and a big release from Claytor Dam yesterday afternoon (flow shot up to 5000cfs +) and we finished up just before it arrived. Plans are pretty much complete, most of our flies tied, and all gear shipped out to Wyoming ahead of my arrival mid week next week. Will spend pretty much the rest of the month out there doing our trips. Have a full group this year, David Carter, Ken, Ben, and Dan Karb, and Pat Burney. We will be going in 20mi into the backcountry to the very remote South Fork of the Buffalo where we will fish the South Fork and numerous alpine lakes for some of the most beautiful big and WILD Snake River finespotted cutthroats you have ever seen. This trip has been very popular, enough so that one trip for next year is already full and we are about half full on a second. If you are interested and want to get in the loop please let me know. Its an incredible adventure. Below is one of my favorite photos from one of our past trips…taken early one morning from the side slough at Swabacher Landing access on the Snake. Also, on a different note, there’s an upcoming event you might find interesting….Byron Begley of Little River Outfitters of Townsend, TN will be doing a Fly Tyer’s Weekend in November, November 8 and 9 at Tremont Lodge in the Great Smokies. Join us for a fantastic weekend where you can see/watch some of the big names/best fly tyers nationally and regionally demo their tying skills. I will be tying at the event, it always is a blast and brings forth a nice crowd. Great time to be in the mountains, you can miss the hustle and bustle of the tourist season, take in this great event , and sample some great fishing too….all in the same weekend. 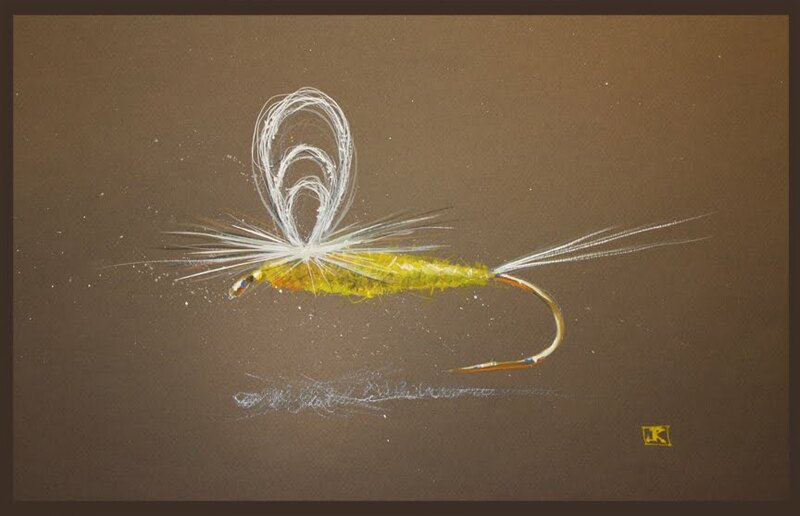 I’ll be tying, then probably fishing as well…..the Clinch below Norris Dam for one, as well as countless WILD streams in and around the Great Smoky Mtns National Park. Will have all the info next week including the tyer lineup and more . 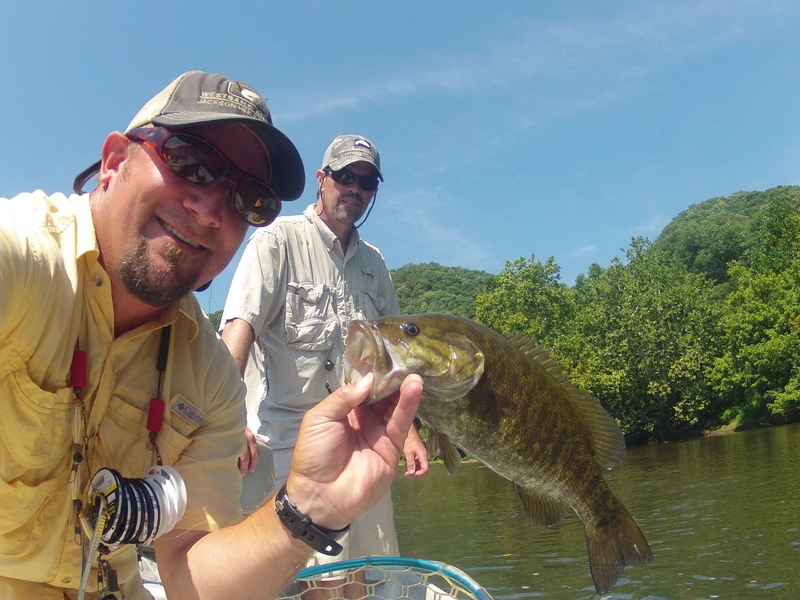 Fri. Aug 8, 2014…..Another early start and headed out early this morning to guide Greg and Alexander Adzima on a New River smallmouth float. Getting an early start to hopefully beat the incoming bad weather. Busy week as we prepare for some upcoming last trips before heading to Wyoming for the rest of the month. Lots of fishing options though, and these late summer rains are beneficial and set us up for a great start to our fall season. More to come…..have a great weekend….